It's wedding week!!!!! We are headed to Brooklyn later this week as we prepare for Claire and Mike to tie the knot. We have been waiting for this day for years! From previous experience, Tucker weddings are a little too fun, I'm sure this will be no different. Last week's bites are below, but stay tuned for a wedding week bites post coming next Monday! 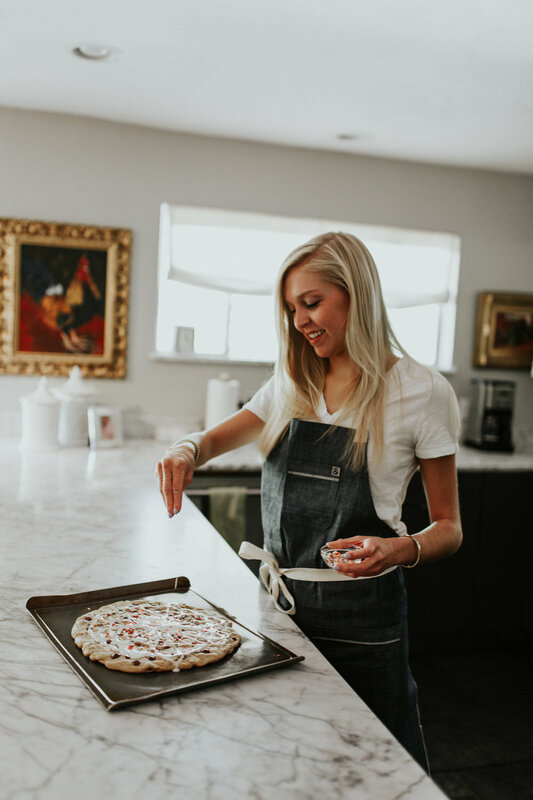 -Another Cookie Pizza recipe because there is really nothing more fun to eat and they are perfect for birthdays. 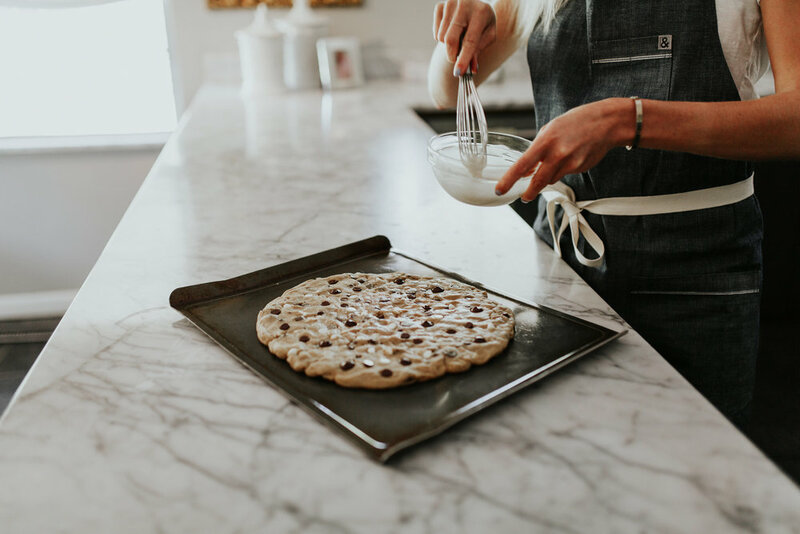 I shared this Triple Chip Cookie Pizza recipe last week with perfect pictures from KGC Photography. -A little downward dog action with #GabetheBabe! Catch us on the StudioHop insta. -A go-to single girl meal, this time fit for a 5 year old. Trader Joe's Frozen turkey burger cooked up and served salad style and with a smile. -Give me Mexican food and a bingo card and I'm sure to have a good time. A successful fiesta raising money for Infant Crisis Services. -Love getting to be apart of the restaurant industry and the friends it has brought my way. Congrats Neighborhood Jam, a sure success. Brunch all day starts tomorrow as they open their doors. PSA get the biscuits and apple jam. -Late night cookies and milk at The Jones Assembly with my sweet treat lover Maddie. -This is the snack mix I based my Banana Chip Savory Snack Mix. I don't have time to make a batch of mine before heading out of town, so the original will do and will make the perfect Whole 30 airplane snack! And booch cause it was on sale at Uptown Grocery for $1.99!! Back by popular demand...another cookie pizza recipe! This time loaded with THREE different kinds of chocolate chips; semi-sweet, dark, and white! Cookie Pizzas are becoming my go to party/celebration food. I've made them for a handful of birthdays, watch parties and a housewarming party. The nostalgia of cookie cakes really makes people freak over them. 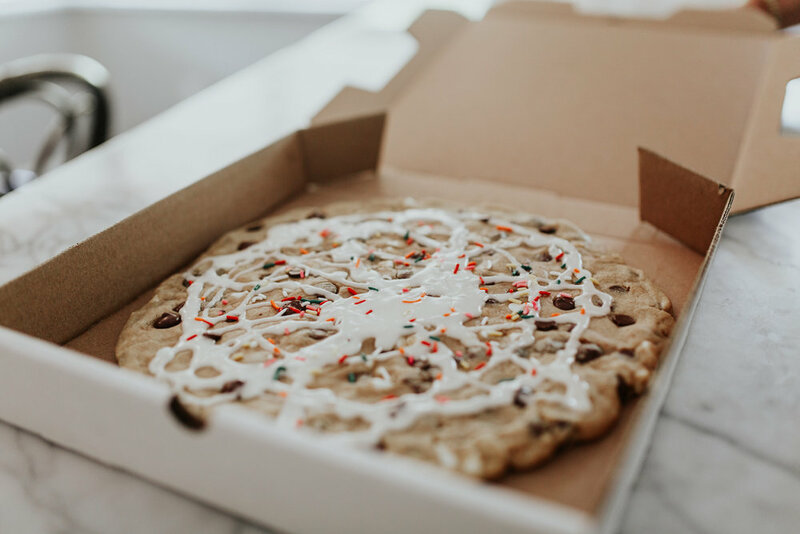 And if you spent 5 minutes at the University of Oklahoma you without a doubt had a taste of a Cookies & Cards "cookie pizza." A few weeks ago I spent the morning with my girl Katie of KGC photography. You may remember her from this post. We got together for turmeric lattes, photography and baking. Baking a cookie pizza that is. Not to toot my own horn, but I can make a mean dessert. But Katie knows how to shoot it to make it even prettier than it tastes! This cookie pizza recipe was for a special bestie/roomie's birthday so it got a decoration of multi-colored sprinkles. And since just chocolate chips seemed too boring, white chocolate and dark chocolate got added to the mix. Not that just chocolate chip cookies are bad, because we all know I have a thing for Perfect CCCs. In fact, this pizza recipe is adapted from my CCC recipe! A cookie bigger than my stomach is the best kind of cookie. Find my other cookie pizza recipes here, here and here. Cream butter and sugars in an electric mixer until light and fluffy, about 2 minutes. Add the egg and vanilla extract. Add flour, baking powder and salt, and mix on low until the dough comes together. Add your assorted chocolate chips, reserving a few of each kind, you'll understand why in a second. Give it all another stir. With clean hands spread the dough out on the parchment lined baking sheet. Spread the dough out, filling the circle shape you drew. Before baking, press a few of each kind of chocolate chip into the top of the pizza. This ensures for an extra pretty cookie! Bake for 10-12 minutes. Start on the low end. The key to yumminess in this cookie pizza is for it to be slightly underdone! You want to take it out just before it starts to brown. Then let it cool completely. While the pizza cools, make your glaze. Using a hand mixer or whisk, whisk powdered sugar and vanilla, and a splash of milk until smooth and glossy. Add a touch more milk if you need to. It should be the consistency of Elmers glue. Drizzle the glaze over the top in a swirly whirly pattern of your choice. Top with sprinkles if you prefer. Cut with a pizza cutter and store in a pizza box. This past weekend is one of my favorite weekends in Oklahoma City. The Festival of the Arts comes to town and the Memorial Marathon is run on Sunday. It's always the last weekend in April, and it's always full of fun activities. You would think the last weekend in April would mean sunny spring weather, but we had buckets of rain and fridged temperatures. I'm ready for some May sunshine! -My friend Malory posted this salad on her instagram and I enjoyed it all week. My version was spring greens, shredded chicken, dried cranberries, slivered almonds, bosc pears, green onions and a dijon vinaigrette. -Turkey burger Monday with mom, dad and sis. So ready for summer food! -I have a sensitivity to caffeine, so when we had a coffee tasting at work you can imagine the jitters I felt all day. Pictured here: our dirty chai. -Breakfast pizza coming to the brunch menu at The Jones Assembly. -Felt like an oxymoron drinking my green smoothie out of a beer glass. -The Malory Salad was on repeat all week! -So many tastings for The Jones Assembly last week to get ready for our June opening, but nothing can beat our Steak Frites. -The Festival of the Arts is just as much about the culinary arts as it is the artists. The Beef & Blue Sandwich won best in show in my opinion! -Made my M&M Cookie Pizza for Kathleen and John's housewarming party. What you can't see here is that I accidentally doubled the butter...it ended up being just fine and gave it that "melt in your mouth" taste! -25,000+ people ran in the OKC Memorial Marathon, but we all woke up at 6am to see Maddie run the half in less than 2 hours! -After walking up abnormally early for a Sunday to watch the marathon, I had a long nap back in bed then a slow day reading some of my book and snacking on my faves. -Made a batch of What's Gaby Cooking's Basil Vinaigrette. I have lot's of plans for this stuff, stay tuned! You knew it was only a matter of time after our Oklahoma City Trader Joe's opened that I post a recipe with cookie butter. Cookie butter isn't new to me, but now it's at arms reach (DANGEROUS). See here and here where I've used cookie butter before! Cookie butter is great. There is nothing not to love about cookies ground up into a sweet spreadable delicacy. My everyday use for this stuff is spreading it on graham crackers for a nighttime snack, but I really try to limit my intake because it's a deep black hole once you have one bite. It pulls you down this rabbit hole where one taste turns into four or five or more spoonfuls. I've found that baking it off into sweet treats is the best way to make the jar disappear. 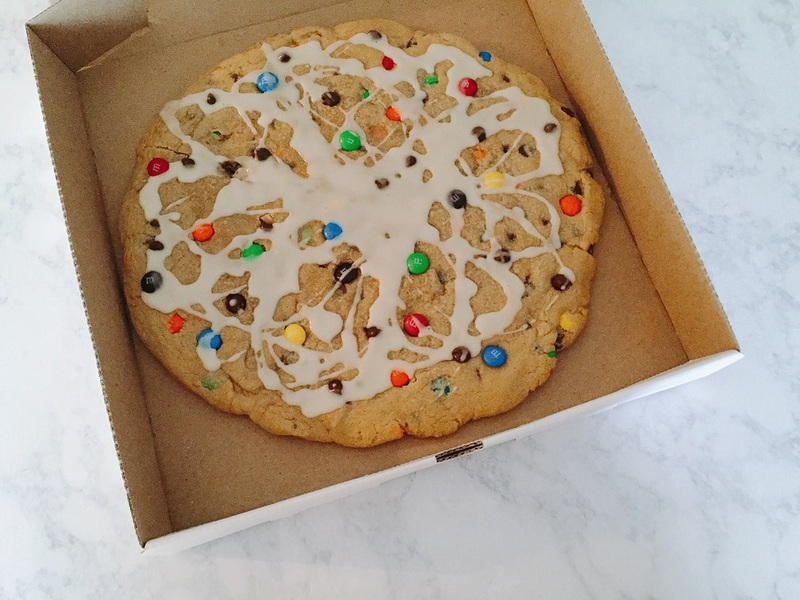 I'm on a cookie pizza kick! 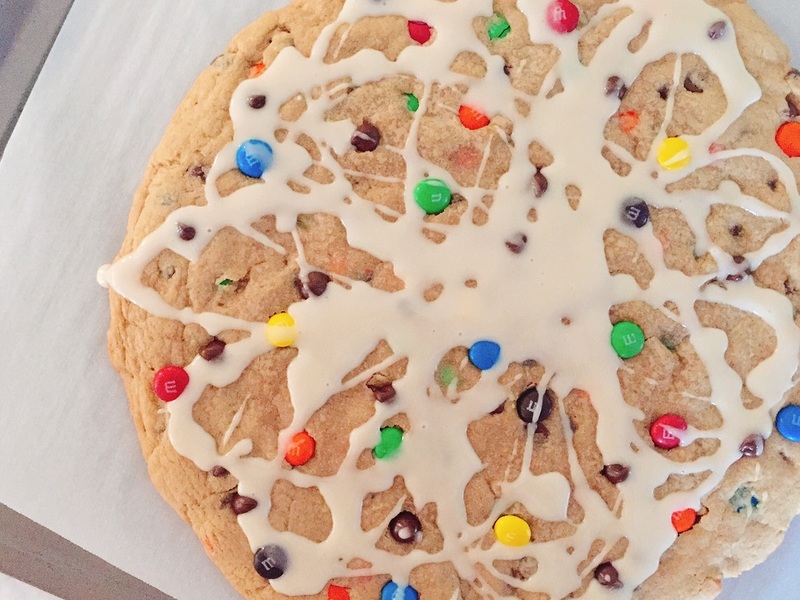 After making my sugar cookie with strawberry icing and chocolate chip M&M cookie pizza, I had been plotting what my next cookie pizza would be. This combo is perfection. I took my mom's ginger cookie recipe and adapted it to turn into a cookie pizza. Cookie butter already has a gingerbread taste to it, so it only makes since to turn it into a glaze and lather it all over the top! One big soft ginger cookie smothered in cookie butter. All the heart eye emojis!! Cream butter and sugar in an electric mixer until light and fluffy, about 2 minutes. Add the egg and molasses and mix on low. Scrape the sides and bottom of the bowl to make sure the molasses is evenly distributed. Add flour, baking soda, cinnamon, cloves and ginger and mix on low until the dough comes together. With clean hands spread the dough out on the parchment lined baking sheet. Spread the dough out, filling the circle shape you drew. Sprinkle the top with extra sugar. Bake for 10-12 minutes. Start on the low end. The key to yumminess in this cookie pizza is for it to be slightly underdone! I found 11 minutes to be perfect, but that is according to my oven. Let it cool completely. Once the pizza is cool, make your glaze. In the electric mixer with the whisk attachment or using a handheld mixer, whisk powdered sugar, cookie butter and milk until fully mixed. It should be the consistency of thick glue. Using a spatula, spread the icing over the cookie pizza leaving about a half inch border around the edges. Sprinkle the top with cinnamon. All hail Trader Joe's being in Oklahoma and all hail cookie butter! Huzzah! I love a good cookie cake. When it comes to store bought cakes and you have the option of the sheet cake with overly sweet buttercream, or cookie cake, I go cookie cake. This M&M and chocolate chip flavor brings that classic cookie cake taste home! It's made very similarly to the sugar cookie pizza. You want to make sure and under cook it a bit for ultimate doughy taste. I found 10 minutes to be perfect. And here is a tip I learned while developing the recipe to help make it extra pretty. Right after the pizza comes out, press a few extra chips and M&Ms into the surface. It's all about visual appeal first. Cream butter and sugars in an electric mixer until light and fluffy, about 2 minutes. Add the egg and vanilla extract. Add flour, baking powder and salt, and mix on low until the dough comes together. Add your chocolate chips and M&M's and give it another quick stir. With clean hands spread the dough out on the parchment lined baking sheet. Spread the dough out, filling the circle shape you drew. Bake for 10-12 minutes. Start on the low end. 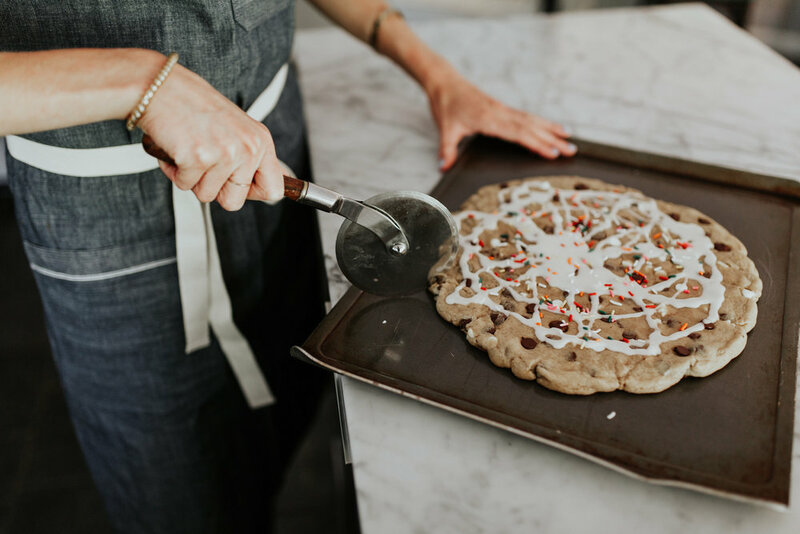 The key to yumminess in this cookie pizza is for it to be slightly underdone! You want to take it out just before it starts to brown. *Right after you take it out, lightly press a few M&Ms into the top of the pizza. This ensures for an extra pretty cookie! Then let it cool completely. I love serving these cookie pizzas in an actual pizza box. It's a fun play on the name and actually a great way to transport it. A local pizza shop has been nice enough to give me a few of their to go boxes when I go in. I may have lied and said I needed them for a school project...but still. I bet if you asked they wouldn't mind sparing you a few!